I had no access to the internet for days and feeling so out of the world. This shows how internet has a great impact on my life and work. Silly me took awhile to realise that my Oppa’s house is just 5 bus stops away and i can go over during the day to use his wifi. Lol. Because we live near each other , we see each other almost everyday or at least 5 times a week. So one day, he told me that his friend is working as an Aesthetician at the first and only Korean aesthetic clinic in Singapore and asked me to try the services there because Koreans are very well-known for their aesthetics. 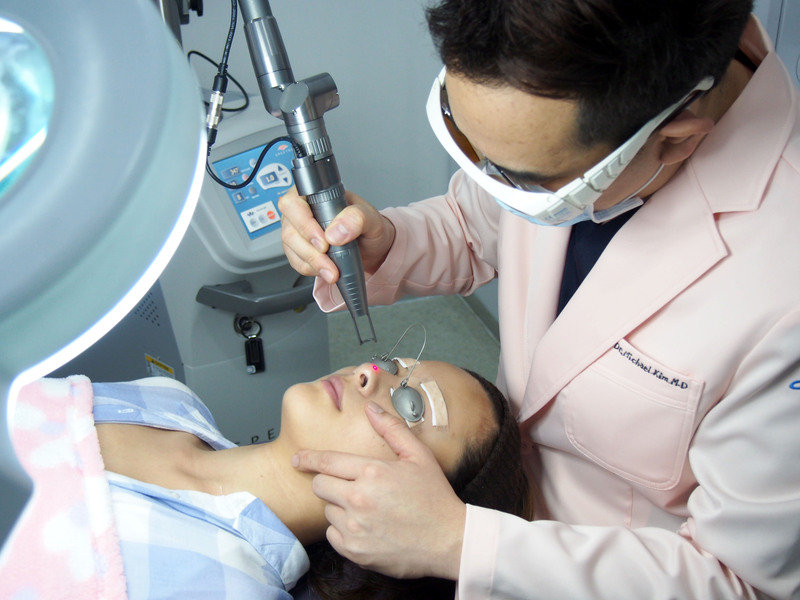 The doctor of the aesthetic clinic is a fully licensed medical doctor in Korea and Singapore. As far as i know , foreign doctors are not allowed to practice in Singapore unless they are registered , licensed and approved by Singapore Medical Council (not allowed to open a clinic until FULLY registered). So I went to check the Singapore Medical Council website and yes he has FULL registration, a Member of Singapore Medical Association and Society of Aesthetic Medicine of Singapore which means he is qualified and licensed to practice and have a clinic over here. Dr Kim is also a Family physician so the clinic provides health screening , treatment of acute and chronic illnesses and medical consultations regarding health care treatment options in South Korea (especially plastic surgery). I have some friends who told me that some clinics or salons claimed their doctors or physicians are from Korea and they were skeptical about it and asked me to check. Don’t know why but i’m like a directory when it comes to all things that is very K. Probably they know i will “turn my head” and ask my Oppa for advices. I respect him alot and always listens to his advices. So i decided to drop by the clinic. It is located at Scotts Medical Centre in Pacific Plaza #06-02. When I walked into the clinic , it reminds me of some of the aesthetics clinic in Korea. Especially the design, feel and experiences. Of course, the doctor is also Korean so you can experience a genuine K-aesthetic feel over at Aeon. I met with Dr Michael James Kim 김지효 and was surprised that he speaks American English. He is fluent in English and Korean so you do not need to worry about language barrier. So I just got to know that he was born and raised in Orlando, Florida (USA) before moving back to Seoul, Korea where he graduated from the top medical university in Korea – Seoul National University College of Medicine – in 2000. 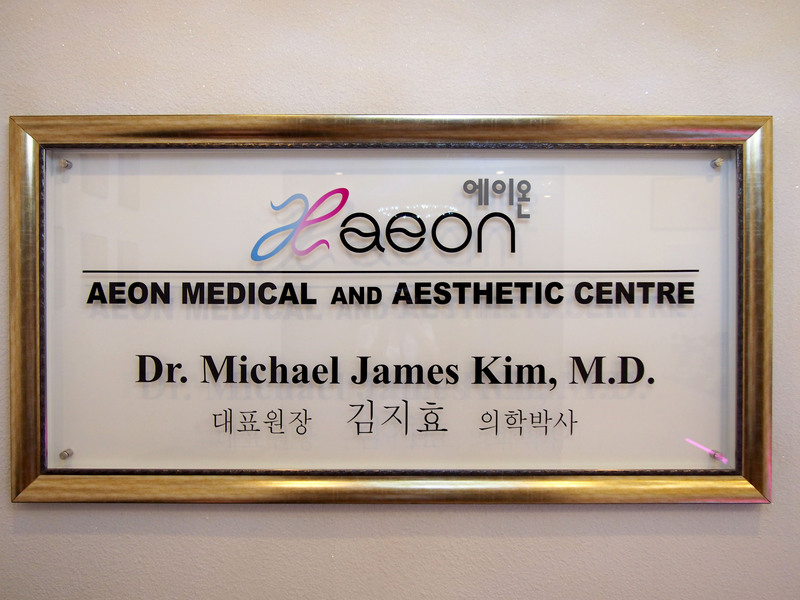 Staff at Aeon Medical and Aesthetic Clinic are all Koreans and they also speak both English and Korean. To improve my Korean, Dr Kim spoke to me in Korean and explained later to me in English. Jina (Clinic Manager) also explain the skin care procedures to me in Korean and then English. They are really patient and I like this point because it means they will listen to their patient’s concerns and not just rush through everything. I was taken on a short tour around the clinic after first meeting Dr Kim and his Korean staffs. 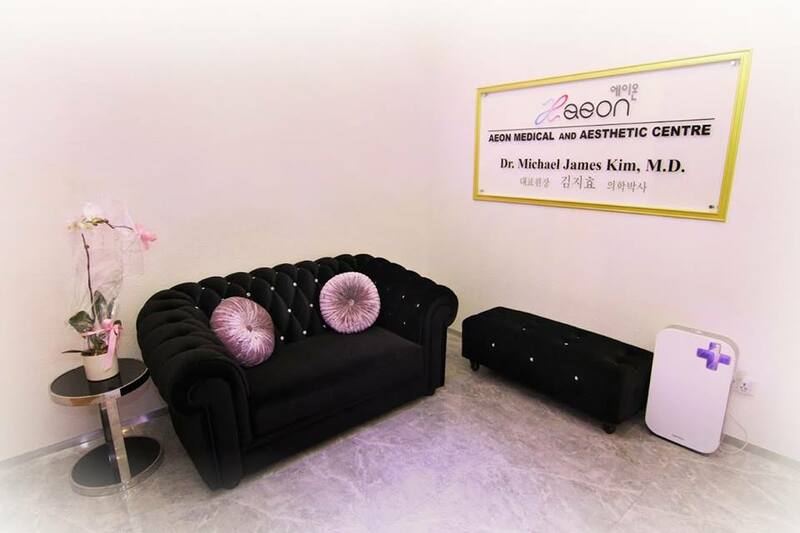 I have been to an aesthetic clinic once in Korea before and Aeon does maintains the “K-feel” of their clinic. This is the reception waiting area where you register your information and wait for payment later on. The 2nd waiting area where you wait and have a sip or cup of coffee overlooking the view of Scotts road in between treatments or while waiting for the doctor. You can have refreshments and read some magazines etc. This area is away from the main traffic and main door because some women are uncomfortable revealing their bare face (aka no make-up face) so you can have some privacy over here. 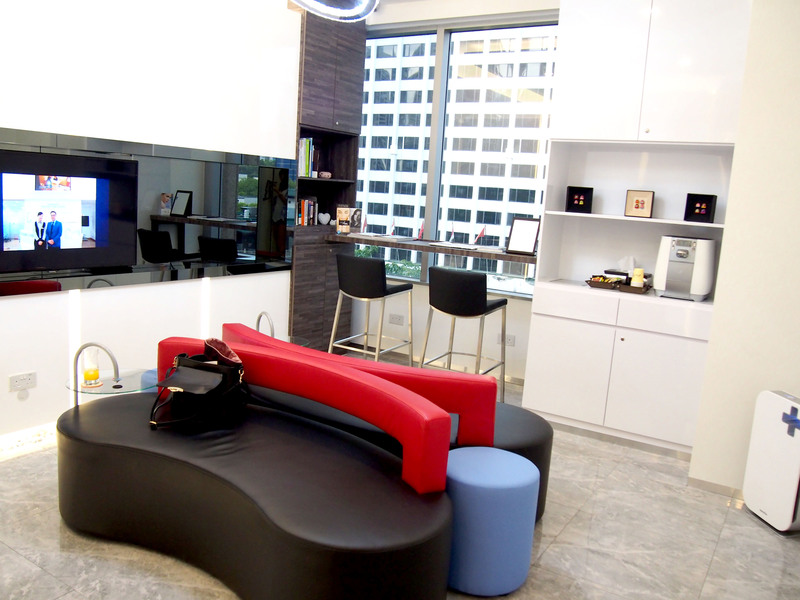 If you noticed , colour of the sofa is that of a Korean national flag – Black , Red and Blue. Sipping coffee and overlooking Scotts Road in between your treatments or while waiting for doctor. The 3rd waiting area is more exclusively private where you can wait before or after your procedure while you are bare faced. We all come to an Aesthetic clinic to have our skin concerns answered and having private areas makes a patient feel more comfortable and not so wary or embarrassed. This experience is really very Korean. I accompanied a friend to an Aesthetic clinic in Gangnam before and i was moved from rooms to rooms like that for privacy purposes and away from the main traffic. Next , i went into Dr Kim’s consultation room. It is brightly lit and spacious. There is a door in his consultation room which links to the Laser Treatment room. Being really patient , he went through all his machines with me and told me which machine is for what , etc. Before my consultation, I was brought into the powder room where I cleansed my face before using the VISIA® Skin Analysis machine to analyze my skin concerns. VISIA® Complexion Analysis is a 3D skin analysis machine which helps to evaluate your skin and look what’s deep in your skin. 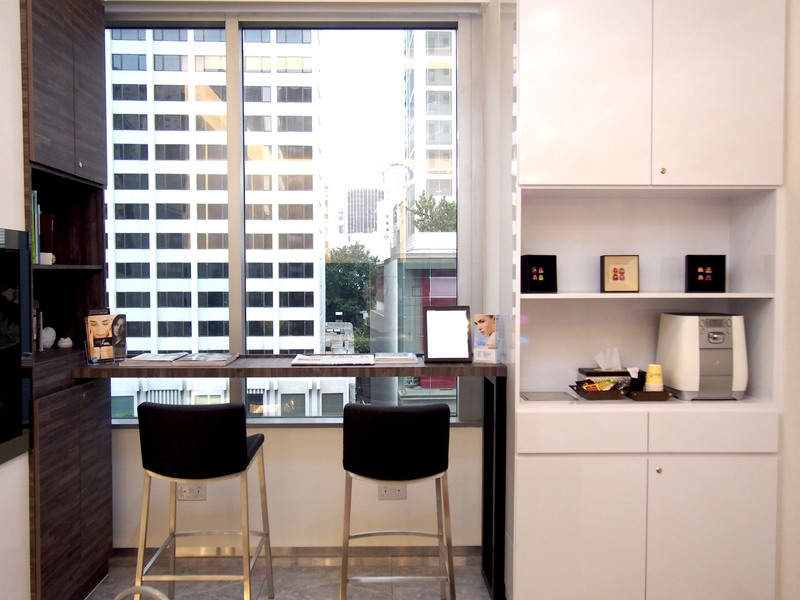 In this powder room , you can put on your make up and set your hair after your treatments before leaving the clinic. They do provide hair curler, hair straighteners, hair dryers, brushes, cotton pads, hair wax/hair spray, etc. I wore a headband to push away the baby hair off my face and had my skin analyzed with the VISIA® Complexion Analysis machine first. After analyzing my skin , the reports were sent straight to Dr Kim’s computer for him to review before meeting me. 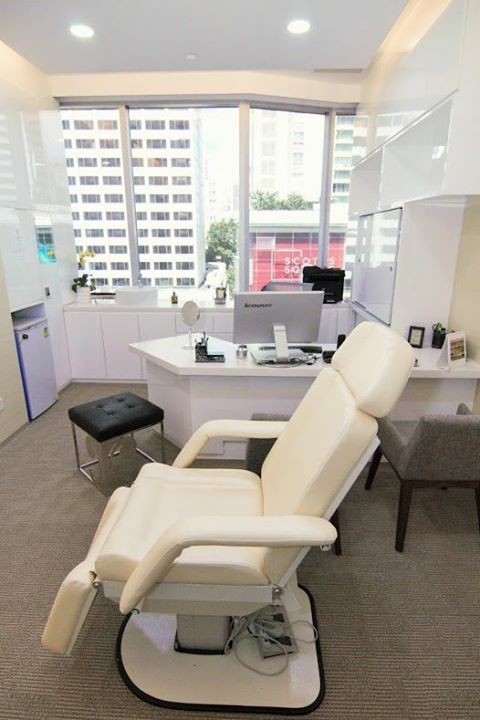 In Dr Kim’s consultation room , he reviewed my skin according to Textures , Brown spots , Red Areas , Wrinkles , Pores, UV spots and Porphyrins (acne). I scored 98% on texture (which means I have smooth skin ) and other areas except for UV exposures where I scored only 50% (average). All the facial products I used help to give me smooth, soft and a youthful look, but there was always one major concern for me – UV skin damage from sun exposure. I have thoughts about switching my photo shoots indoor because the sun exposure will damage my skin. I’m thinking of getting the unique oral sunblock from the clinic which provides UV protection for whole body and is available only in doctor clinics 😦 I’m dying to get rid of the freckles on my cheeks and will probably do the procedure (BBL) in August since I have no photo shoot for 2 weeks then. 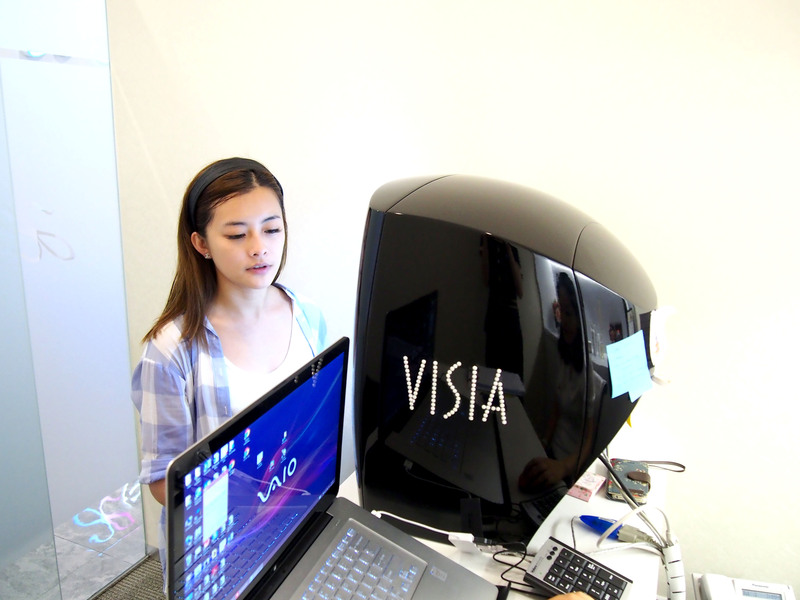 The VISIA machine can also do a computer stimulation to show you how will you look like if you do not take care of your skin , when you are older and also how it will look like after the treatments. Based on my skin analysis, Dr Kim decided to perform Clarity Peel on my nose to minimize pore size and smooth the texture and also Clarity Toning (laser skin toning) for my whole face. So i was brought into one of the medical skin care rooms where Elena cleansed my face while also providing a good facial massage “Korean style”. Once my face was properly cleaned, a special lotion pack will be applied onto the areas where the doctor will perform the laser on for pore treatment. The lotion pack is supposed to be absorbed into your enlarged pores so that it can be targeted during laser procedure. Before the pack was applied, Dr. Kim marked out the affected area for the pack to be applied for more precision. 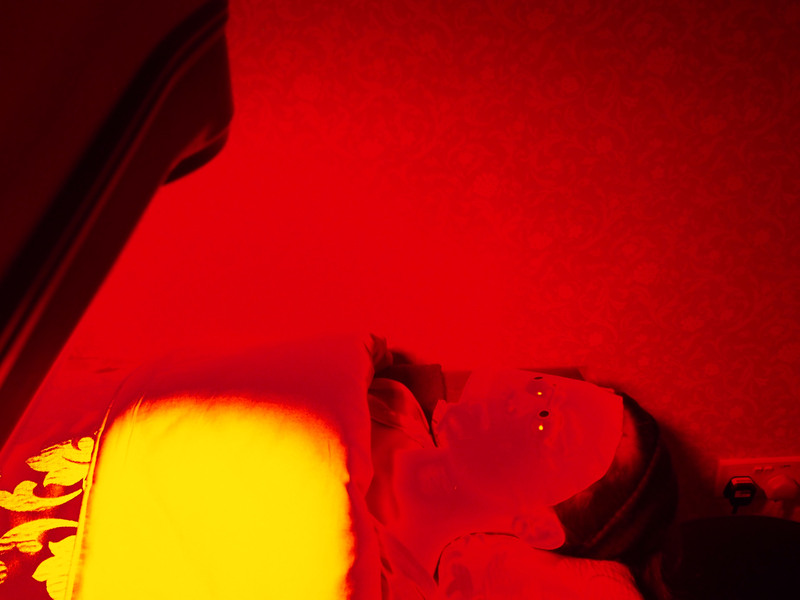 After about 10 minutes, the pack was wiped off and i went into the laser treatment room. Dr Kim worked on my nose area first before doing the Clarity Toning on my whole face to even up and lighten the tone. The laser treatment was painless and I didn’t feel any discomfort. Before the procedure, he asked what type of music I liked and they played some on their nice pink(!) music player while he carried out the laser treatment (I like K-drama OSTs ). There is no down time so you can go on with your daily activities after the treatment. 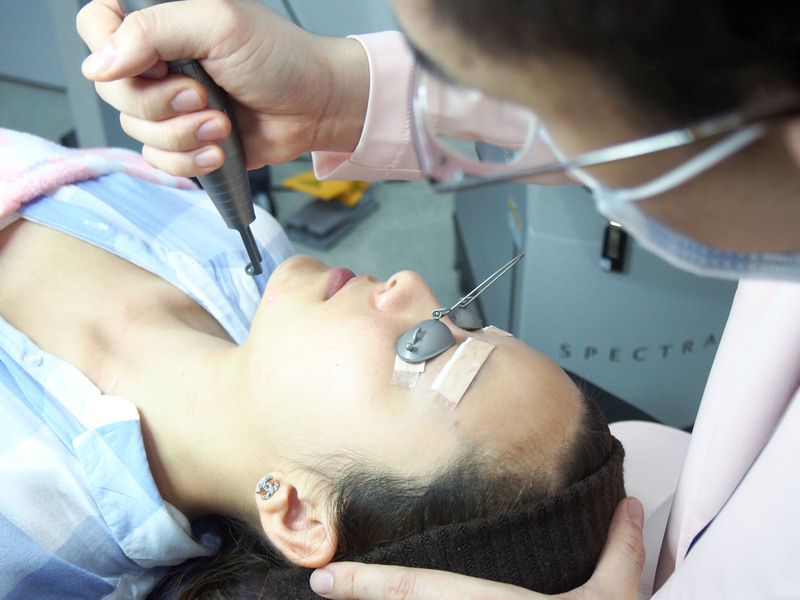 Dr Kim also did Clarify Gold Toning which helps to reduce the redness at the sides of my nose area. 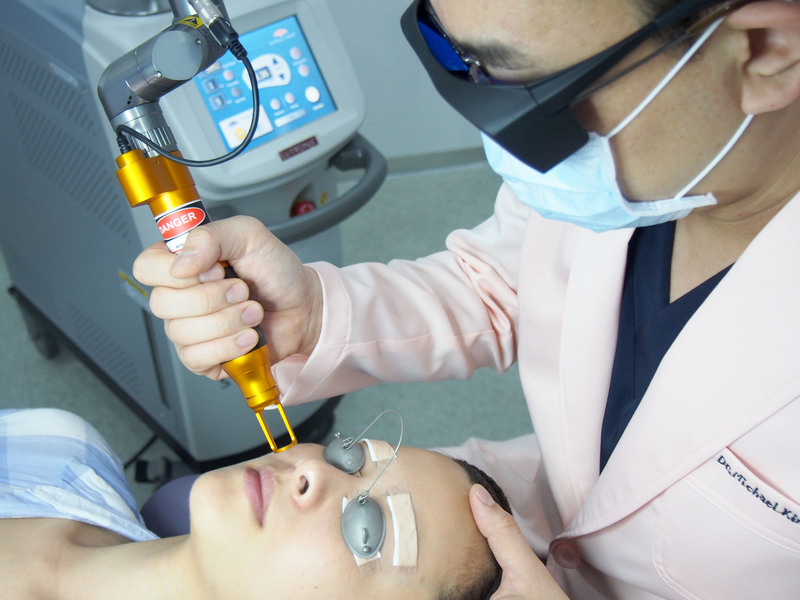 Laser toning is a very popular aesthetic procedure in Korea. 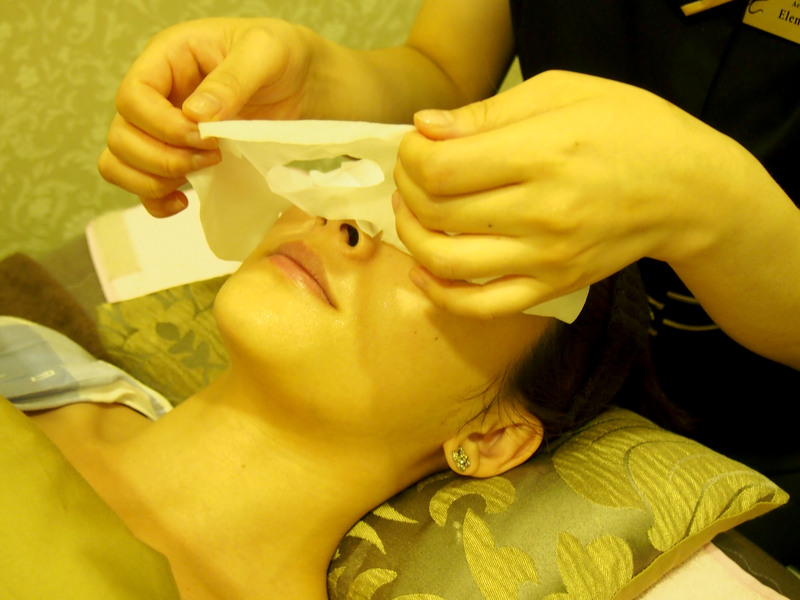 Many Korean ladies go for fortnightly or monthly laser toning treatments and in addition take extra steps in their daily home skincare regime. No wonder their skin looks really good! Sometimes I even got a shock at how many bottles of skin care products I have on my make-up table. Aesthetics is a really good start to help you resolve your skin concerns and having a strict and disciplined home skin care regime helps you to maintain and manage it well. After the laser treatment, I was brought back to the medical skin care room for another round of skin care by the aesthetician to cool and calm my skin. This machine also helps to brighten my skin tone at the same time. Not to mention a time to relax also! This was different from other clinics where they usually just apply sunblock and send you out. Last step was putting on the collagen facial mask. A rotating medical LED light was applied to my face for my skin to absorb the essences from the mask better, reduce acne bacteria and rejuvenate the skin. After about 20 minutes, I was all done! The remaining essence was massaged in to my face and neck by Elena which was very relaxing and soothing. AEON Post-laser rejuvenation moisturizer (Total recovery cream) and AEON CC cream sunblock was then applied on my skin. 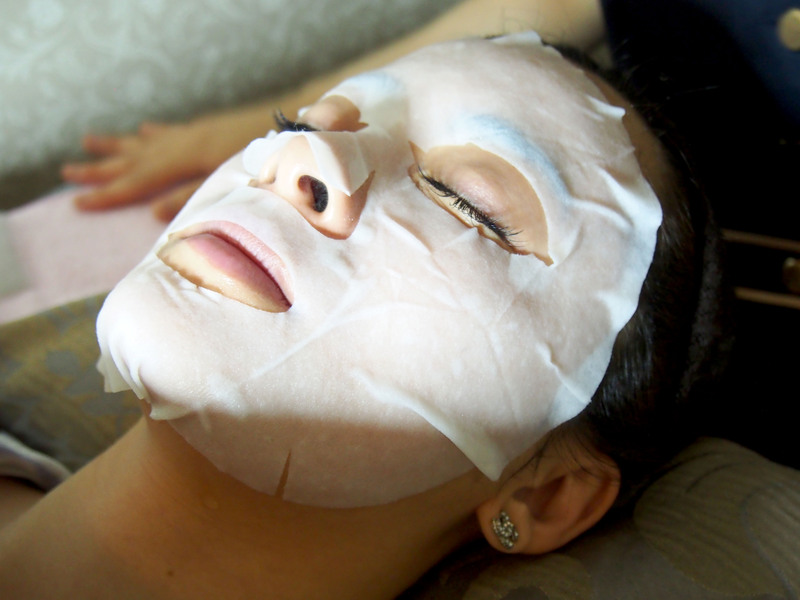 I can see that my skin looks really radiant and smoother after the treatment. Pores on my nose were visibly minimized and redness at the sides were reduced. I went into the make up room and took me only 5 minutes to put on my eyeliner , blushers and lipstick because i do not need much time to put on my Hera UV Mist Cushion. Feeling more confident without make-up right now. The staff were all very friendly and professional just as I experienced in Korea and look forward to my next appointment at AEON again. I met Oppa after my treatment and he gave a big nod of approval. You can mention my name when you head down to the clinic. Hello dear, may I know what’s the price like? 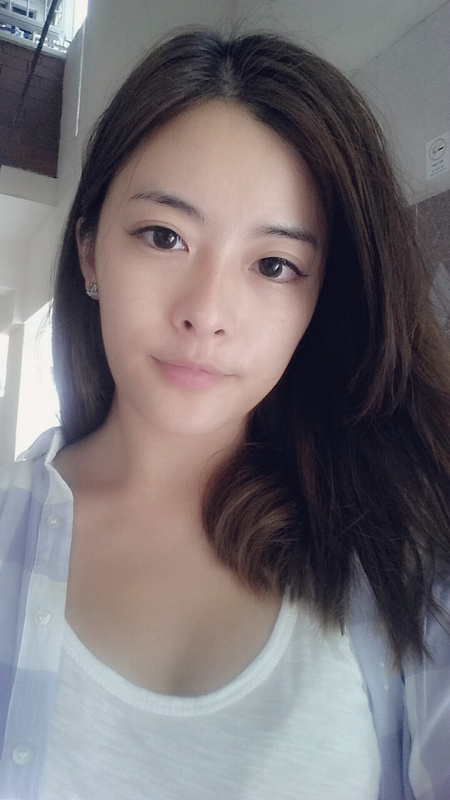 Hi peiling! Mind to share, how much does it cost roughly for your treatment? 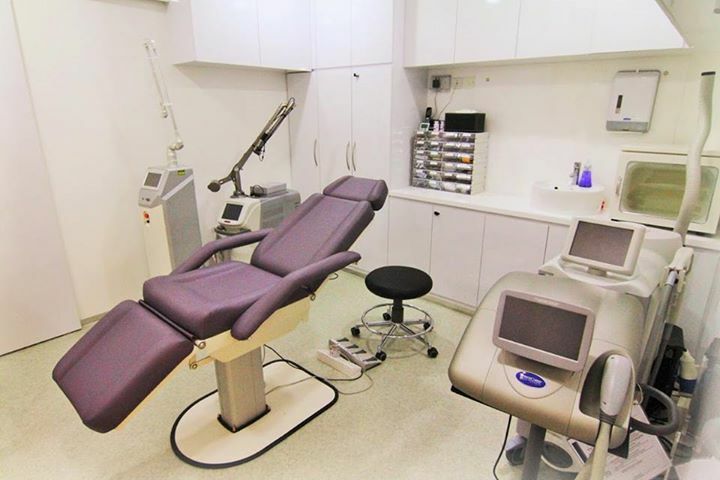 Hi Peiling, for all the procedures you have mentioned, how much does the clinic charge? I’m interested in it… but what are the prices of the treatments? hi Cheree You can call 67332002 to enquire because it depends on your skin condition and skin type to determine the type of treatments you need.